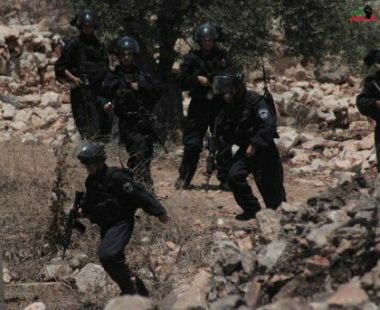 Israeli soldiers attacked, Friday, the weekly protest in Kufur Qaddoum, and fired many rubber-coated steel bullets, gas bombs and concussion grenades. Morad Eshteiwy coordinator of the Popular Committee against the Wall and Colonies in the village, said the soldiers attacked the protesters, leading to clashes. He added that the army fired many gas bombs, concussion grenades and rubber-coated metal bullets on the protesters, while some of them hurled stones on the invading army vehicles. The incident caused no injuries. The residents in Kufur Qaddoum started their weekly marches in June 2011, protesting the closure of the village’s main road, that was completely sealed by the army in 2003, in order to enable easy access to Kedumim illegal colony, built on privately-owned Palestinian lands. Also on Friday, many residents of Bil’in village, west of the central West Bank district of Ramallah, held the weekly nonviolent protest, accompanied by Israeli and international peace activists.